How to Import 3GP to iMovie from BlackBerry Android, Samsung, and etc? When try to import 3GP movie files to iMovie for editing, only to find iMovie even cannot add the 3GP video let alone to edit 3GP movies in iMovie. The following article will shows the various situations in fail to import 3GP into iMovie as well as provide a simple solution on how to successfully import all kinds of 3GP movies to iMovie in whatever situations. When I import the .3gp files which I have 'Bluetoothed' from my mobile phone to my Documents folder to iMovie, the file browser only shows them 'greyed out' so I cannot select them. I shot some videos with a mobile camera and the format is '3gp'. They are stored on Mac hard disk in 'My Videos' folder. I want to open them in iMovie but I Movie doesn't recognize them as videos. I have a blackberry for work that makes movies in 3gp format, when I email and save them down on the Macbook Pro, they won't open and won't import to iMovie. I have the Samsung Galaxy Android phone, which records HD videos into files with the .3GP file extension, when I try to import it to iMovie, a dialogue box tells me I cannot import a .3gp file. iMovie 11 imports and converts my 3GP files into .MOV files. 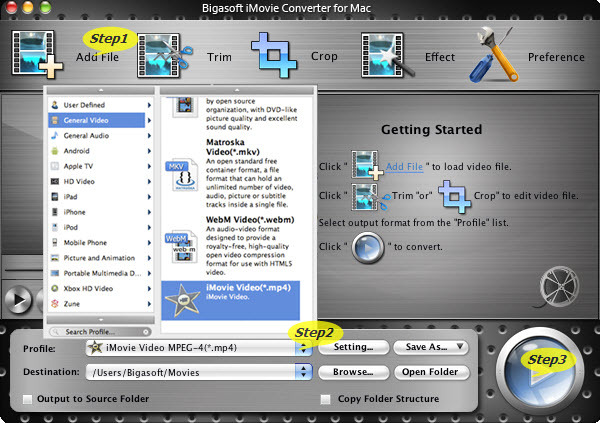 However, the resulting MOV file is approximately four times larger and iMovie 11 degraded the quality when it converts 3GP to MOV. Though iMovie 11 now supports importing some of the 3GP files, the imported 3GP files will take extremely larger disk space and degrade the video quality. Though we can import some 3GP movies to iMovie by simply change the file extension to .mp4 or .mov, we cannot import all kinds of 3GP files to iMovie. The following will introduce a simply solution on successfully import all kinds of 3GP files whatever it is recorded from mobile phone like BlackBerry, Android, Samsung, Nokia, Motorola and etc or downloaded from website and etc to iMovie '11, '09, '08 with no loss of video and audio quality. 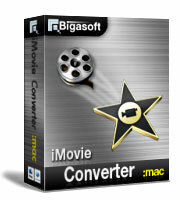 Free download the professional 3GP to iMovie Converter - Bigasoft iMovie Converter for Mac, install and start it, the following interface will pop up. 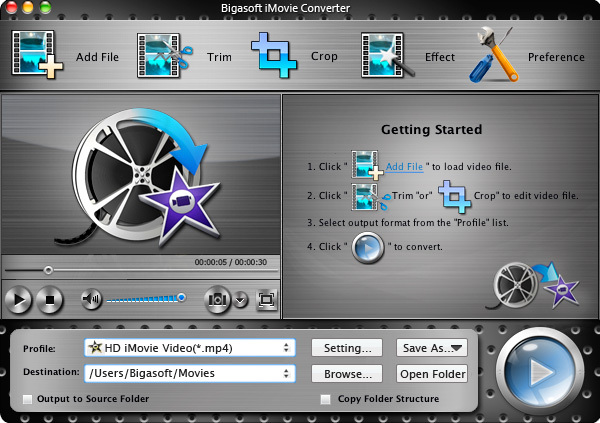 Drag and drop the 3GP movies to the main interface of Bigasoft iMovie Converter. Or click "Add File" button to add the 3GP video which you want to import to iMovie. Click the drop-down button on the right side of the "Profile" button to select iMovie Video MPEG-4 output format as output video format from "General Video" category, you can also select MOV or DV as output video format according to your preference.